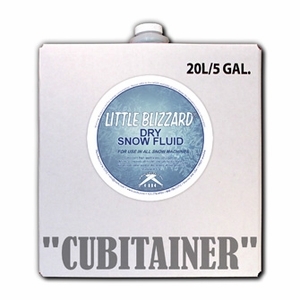 One 5 Gallon Cubitainer of Dry Little Blizzard Snow Fluid. Used when the Little Blizzard is higher or being blown further and it is evaporating to quickly for the customer to be able to touch the floating snow. We have found when it disappears to quickly, the public is frustrated. To keep them happy, they can now touch it before it disappears. Also used in dryer climates where humidity is low.